Blue Jays 7, Indians 4: I was invited to go to this game by the Indians, where I would have watched it for free from the Tribe Social Suite. Because of family entanglements I was not able to go, and when I sent the Indians my regrets, I was very sad about it. But 16 innings on a 44 degree day, with beer sales being cut off for more than half the game? Er, kinda glad I didn’t go. What I missed, of course, was an excellent Justin Masterson getting boned and a bunch of near-fisticuffsmanship, en route to the longest game in Opening Day history. J.P. Arencibia won it with a three-run homer in the 16th. Casey Kotchman and Colby Rasmus each went 0 for 7, which surpasses golden and platinum sombreros by a mile. I think they were unobtanium sombreros. Good show! Reds 4, Marlins 0: Johnny Cueto tossed seven shutout innings as the Marlins did their part to contribute to the NL East’s collective offensive ineptitude on this Opening Day v3.0. Indeed, the entire division played yesterday, and they scored a total of four runs. Phillies 1, Pirates 0: Eight shutout innings, two hits, no walks and five strikeouts for Roy Halladay. Ho-hum. Remember when we were supposed to care about his lack of velocity? Nah, me neither. Tigers 3, Red Sox 2: Wrote this up yesterday, both here and here. 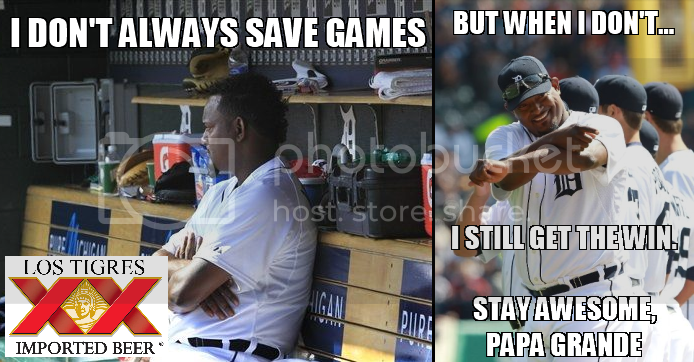 So for now, I’ll leave you with this depiction of Jose Valverde’s day. Mets 1, Braves 0: The Red Sox and Braves both lose in dispiriting fashion. It’s like 2011 never ended. Not that the Braves didn’t have a couple of chances, but they’re the Braves and they don’t win games unless three guys hit homers and stuff. Johan Santana got headlines for being impressive — and given his recent history, he was impressive — but Atlanta squandered a couple of good opportunities here. Nationals 2, Cubs 1: The Cubs waste a fantastic Ryan Dempster start in which he struck out ten in seven and two-thirds. Stephen Strasburg was nearly as good, but neither figured in the decision. Ian Desmond singled in the winning run in the ninth. The Cubs, in contrast, ran their way out of a scoring opportunity in the bottom of the ninth when pinch-runner Joe Mather was thrown out trying to score on a grounder to third. Too bad my little league coach wasn’t there to yell at Mather to make sure the ball got through. He was really good at teaching 11 year-olds that. Dodgers 5, Padres 3: Clayton Kershaw started this game despite suffering from a nasty flu that had him vomiting and — according to Vin Scully — having diarrhea. Which I’m going to go out on a limb and guess was the first and last time in his 60+ year career that Scully said the word diarrhea during a broadcast. Kershaw looked like he was going to be able to hold up for a while — he threw three shutout innings and he even hit a double — but ran out of mojo. Five Dodgers relievers held the Padres off, while Edinson Volquez walked in two runs with the bases loaded. Matt Kemp hit a homer and was caught stealing, so his quest to become the first member of the 50/50 club was partially successful. Only one more Opening Day, folks!